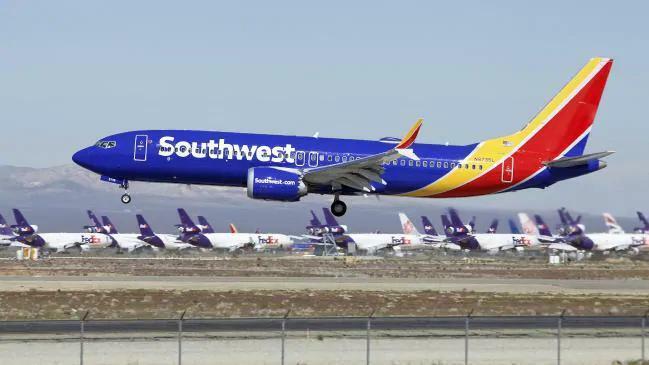 WASHINGTON, March 26 (Xinhua) -- A Southwest Airlines Boeing 737 Max, on its way to be grounded, made an emergency landing at the Orlando International Airport (OIA) Tuesday afternoon, authorities said. The plane took off from the airport in Orlando, U.S. state of Florida, shortly before 3 p.m., according to OIA spokeswoman Carolyn Fennell. Airport officials said the plane, with only a pilot and a co-pilot on board, experienced a malfunction and had to return to Orlando for an emergency landing. It landed safely. The Federal Aviation Administration said the plane, which being ferried to western state of California to be grounded, experienced an engine problem and that it is investigating. The incident came after the global fleet of 737 Max jets was grounded indefinitely this month after two fatal crashes involving the planes. A Boeing 737 MAX 8 plane operated by Ethiopian Airlines crashed shortly after taking off from Addis Ababa, the capital of Ethiopia, earlier this month, killing all 157 people on board, a few months after a plane of the same type, went down in Indonesia, which left 189 people on board dead.